A loyal dog, a survival trip and an emotional, heart-wrenching story of a kid with cancer all in one! I knew I’d love this one! 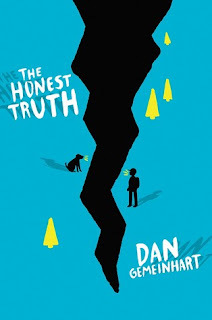 The Honest Truth was written by Dan Gemeinhart and published by Scholastic in 2015. From a writer’s perspective, I liked the authentic details about the wilderness that the author embedded in the story. They helped to create a strong sense of place. Though it wasn’t always clear how much time was passing. The Honest Truth is Dan Gemeinhart’s first published novel. Cancer is a hard topic to tackle in middle grade books. Sounds like the author did a good balance of having this part of the story without having it be the main focus. Glad you liked it so much. I read this one after reading too many other sad books. Had trouble finishing it and went on a humorous reading binge for several weeks. I read this one too, and found it awfully sad. Well-written, just a little too sad for me.